Situato sulla cima di una collina, la proprietà ha una splendida vista su Perugia, Assisi e del paesaggio complessiva dell'Umbria. Nella proprietà ci sono totalmente 6 appartamenti, che può essere un luogo ideale per la famiglia o gli amici riunione. Ogni appartamento è self catering e completamente attrezzata, con una terrazza privata che è perfetto per mangiare all'aperto o semplicemente godersi un bicchiere di vino. La struttura dispone anche di un grande uliveto con salottini attrezzati che gli ospiti possono godere per cenare sotto gli alberi di ulivo. Vi è anche una grande area coperta, nostra veranda - Portico, con tavolo da biliardo, tavolo da ping-pong, calcio balilla, che è perfetto per i bambini e adulti di trascorrere insieme del tempo di qualità in ore più calde o durante i giorni di pioggia. Gli ospiti possono anche godere il loro tempo ad esplorare la zona in quanto vi sono diverse strade di monitoraggio vicino alla proprietà. We, my husband and 2 children (17 & 19), stayed here for 2 weeks in July 2018, we had a really wonderful time. The apartment, a converted farm building, with beams, shuttered windows, big rooms, and high ceilings, was lovely , the decor was rustic and homely. Tanya had added simple thoughtful touches that just made it easy to be there from the moment we arrived. With busy lives in England the drive up through the Olive groves, with clean mountain air and the tranquility of the place made us all shift down a gear and relax. We spent mornings under olive trees eating breakfast, swimming in the pool, and reading books. I was able to find a quiet spot to practice yoga, sometimes joined by Tanya, n the shade of the trees. Tania has also provided a shared covered open area with lots of seating, table tennis, snooker and table football. We had a lot of fun despite my lack of skill, playing snooker and table tennis. There is so much space that was easy to find a quiet hammock to relax in, or spend time with some of the other families there. we used the pool everyday, to swim, mess about or cool down in. There are plenty of sun loungers, chairs, hammocks and sunshades, so no need to race over with a towel! The surrounding towns and villages are a wonder to explore. I almost don't want to say how lovely they are, as the peace and tranquility might change, But Ovieto, Speloto, Assisi, Perugia, Gubbio, the beaches (2 .5 hours away but worth it) are all un-mined gems. The architecture is from the 13century, with higgledy piggelby lanes, frescos, towering castles, roman arches, churches, little shops all mixed together . We walked in the mountains near Castellucia, hired a speed boat ( brilliant fun) on lake Trasimeno, and explored towns. Everyone we met in shops or restaurants was friendly and laid back. The places to visit are spread out and rural so would be difficult to get around without a car, we didn't use public transport. And finally to say Tania, who owns the apartments with her family, is really lovely. She is kind and thoughtful. If you need any thing or have questions about the area she is really helpful. She has created a beautiful place of tranquility, but if you feel energetic she organises pilate classes some evenings. The 2 dogs, Baghy and Goa, trot about and say hello, and the cats find shady spots to lie in. Dear Marie! Just to thank you and your family for your kind words...needless to say, we are very much looking forward in having you all here with us soon again! Les appartements sont confortables, propres et bien équipés. La piscine est très agréable et la salle commune un lieu de rencontre et de partage pour les familles. We have just returned from staying in the 3 bed roomed apartment here and have to say that to date it was the best Owners Direct self catering apartment we have stayed in. Very welcoming hosts who were most helpful for example booking horse riding for us locally and providing maps. The apartment was huge and with a very well equipped kitchen and comfortable lounge and beds.The gardens and pool are beautiful as are the views and quietness. The games room was popular with the children too. Dear Rachel and family, we are very happy you have enjoyed your stay at our property! We always strive to make our guest's holidays memorable, and your words are a great reward for our work! Comfortable, peaceful, pleasant and cheap! Two weeks we stayed with our three daughters (17,15.13) in one of the six appartments at Podere Schioppello. 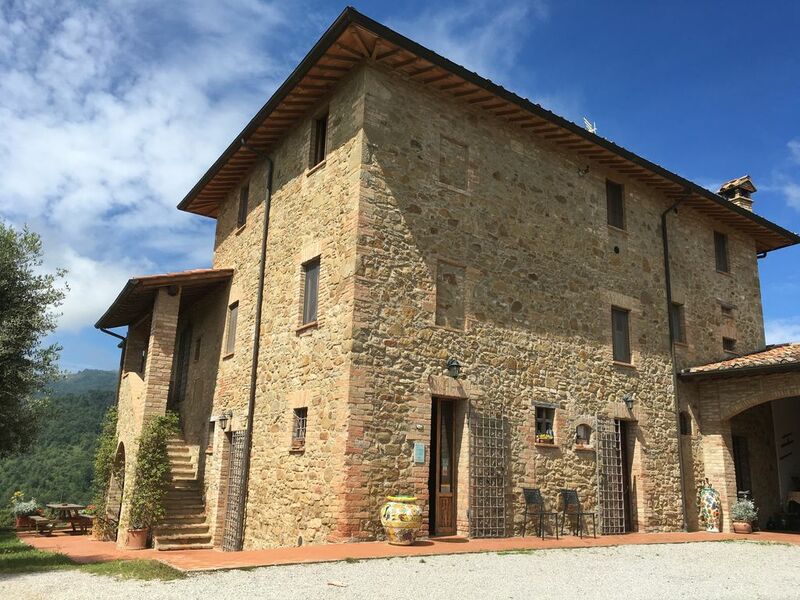 We enjoyed the weather, the cosy, clean and comfortable house, the beautiful surrounding (the house is on a hill and overlooks the Umbrian scenery untill wonderful Perugia and Assissi), the swimming pool, the international contacts with families with children of all ages and elderly couples. At At the pool and under the arcade we've met Canadian, American, Swedish, Polish, English, Belgian and Dutch people. Some practical information: several small shops are in Pietrafitta, a village nearby. If you want to go to a supermarket, you have to drive to Tavernelle (9 kilometers). Tanja, Francesco and Tana, thanks again. Our holydays were very relaxed!